Hemp comes from the same family of plants as marijuana, however, the type of hemp that is used for industrial purposes and human consumption has been bred to contain very low levels of the active ingredient in marijuana and higher levels of fiber, oil or seed. Hemp seeds are very nutritious, containing nutrients including omega-3 fatty acids. Omega-3 fatty acids are essential for good health. Your body can't make them, so you need to get them from food. Omega-3 fatty acids may help to lower your risk for a number of health conditions, including heart disease, arthritis and cancer. Sources of omega-3 fats include the oils from plants, fish and nuts, including hemp seeds, which are technically nuts. 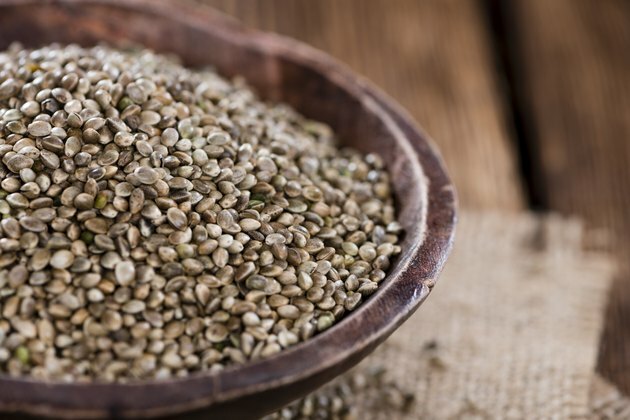 Hemp seeds contain approximately 30 percent fat, 80 percent of which consists of omega-3 and omega-6 fatty acids, or polyunsaturated fats, according to an article published in 2004 in the journal "Euphytica." This makes hemp a good source of these essential fatty acids. Two essential fatty acids, the omega-3 fatty acid stearidonic acid and the omega-6 fatty acid gamma-linolenic acid are found in hemp seed. The type of diet consumed by most people in the United States is very high in omega-6 fatty acids and low in omega-3 fatty acids. Hemp seeds contain a favorable ratio of between two and three parts omega-6 fatty acids to one part omega-3 fatty acids. This is close to the four-to-one ratio recommended by the World Health Organization. Hemp nuts also provide a number of other nutritional benefits. They are approximately 35 percent protein, and the protein they provide consists of easily digestible types of proteins that contain all of the essential amino acids. Hemp seeds also contain fiber, iron, calcium, magnesium, potassium and vitamin E. Unlike fish, one of the better known sources of omega-3 fatty acids, they are unlikely to be contaminated with mercury.